Help Sean find a way out of the gas station office in Life is Strange 2: Episode 1. In Life is Strange 2: Episode 1, gamers have been wondering how to escape the gas station office. After grabbing a map from the gas station store and studying it outside, Sean and Daniel are questioned by the store’s owner, Hank Stamper. 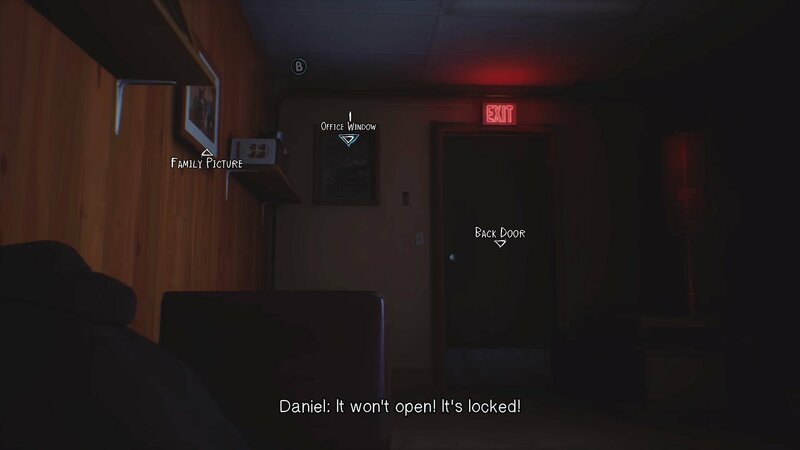 No matter which option you choose after Hank confronts you (flee, discuss, or attack), Sean eventually finds himself locked away in the store owner’s office. Tied to a pipe, you’ll need to run through a variety of tasks in order to free Sean and reunite him with Daniel before Hank returns. To help, we put together a quick guide on how to escape the gas station office in Life is Strange 2: Episode 1. 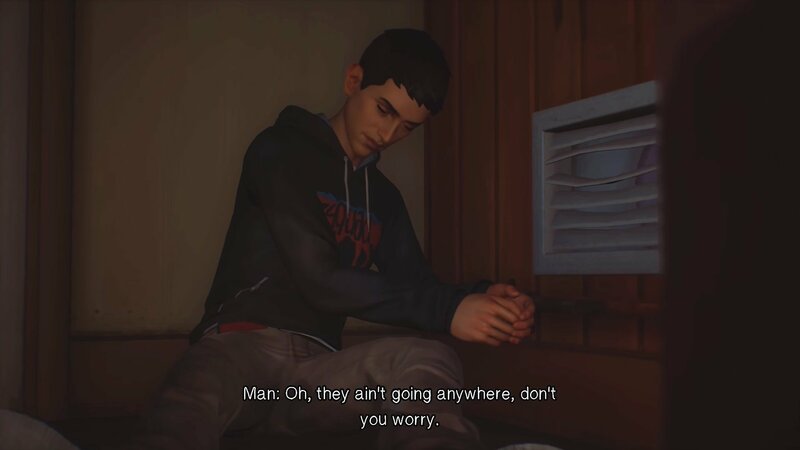 In the second chapter of Life is Strange 2: Episode 1, you'll need to help Sean find a way out of the locked gas station office. After being locked in the gas station office by owner Hank Stamper, you'll need to help Sean escape. To do this, start by interacting with the items around you by selecting the “Look” option. For example, you can attempt to kick open the storage door closest to you, but it’ll be locked. Then, you can look at the computer and Sean will note that he wishes he could get more light from it. After he makes that observation, look to your right near the storage door. There, you’ll spot a cardboard tube which can be knocked over, awakening the computer from sleep mode and filling the room with light. On your right is a beer sign, which you can interact with to push it out of the way. If you look above you, you’ll spot a shelf. Interact with the shelf to kick it, knocking down a carved wooden bear and some papers. Once you’ve interacted with everything, Daniel will begin talking to you through the metal grate. As you’re talking to Daniel, you can ask him for help. First, ask him to tear the metal grate and he’ll respond that he can’t, then ask if he can open the window to the left of the back door. Interact with Daniel to help him find a way into the gas station office in Life is Strange 2: Episode 1. Unable to open the window, you can then prompt Daniel to open the back door, though he'll need keys. Once Sean realizes this, new options appear. The keys are located just to the left of the back door beneath the window. You can try and scoot Sean over, but he ends up getting stuck on a piece of the pipe. When Sean is unable to tear the pipe anchor off using brute force, he can interact with Daniel and ask for a tool. The tool you want Daniel to get you is the carving tool which the two of you might have spotted if you investigated outside around the gas station. If you didn’t do this, Sean will just ask Daniel to get him something sturdy like a screwdriver or wrench. When Daniel returns with the tool, take it from him and use it to pry off the pipe anchor. With that free, you can then scoot Sean over to where the keys are. Scooting him will automatically knock the couch out of the way, so don’t worry about extra steps to move it. When you get close enough to the keys, interact with them to reach them, prompting Sean to kick them off the hook. 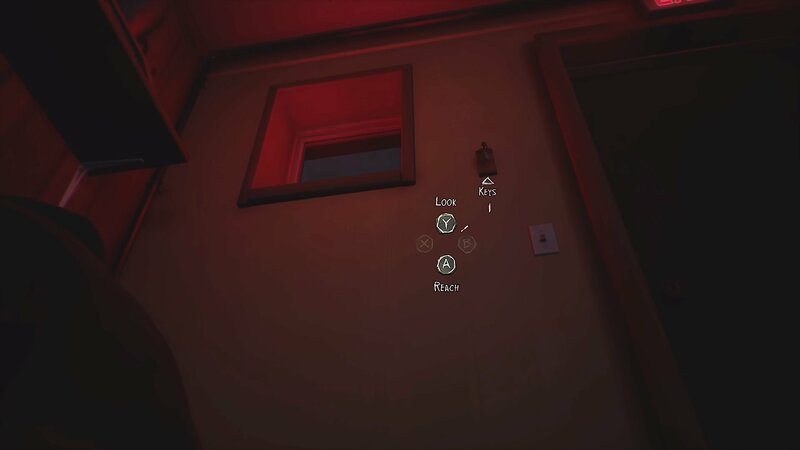 The keys are located to the left of the back door just below the window in the gas station office of Life is Strange 2: Episode 1. On the ground, interact with them again to scoot them into Sean’s grasp. Return to the metal grate and give the keys to Daniel. In doing so, Daniel will open the back door. When Daniel enters, he’ll eventually look around and find a tool to free Sean and the two will be able to exit the gas station office. With a little patience and persistence, you should have no trouble freeing yourself from the gas station office and reuniting Sean and Daniel. So, did you have any trouble escaping the gas station office? What was the hardest part of the task? Let us know down in the comments below! For more on Life is Strange 2: Episode 1, be sure to check out our previous guide featuring all collectible Souvenir locations! By reading through this guide, you should now know how to free yourself from the gas station office in Life is Strange 2: Episode 1.